Transport And Travel In Oban and North Argyll. Car and commercial vehicle servicing, HGV repairs, new tyres fitted, pre-MOT work carried out, breakdown assistance. Members of the 'Good Garage' scheme. Road Haulage Companies moving live bi-valve shellfish such as mussels, oysters, scallops etc under Temperature Controlled Conditions, plus general haulage. Calmac run regular ferry services to many of the islands in the inner and outer Hebrides from Oban. Current timetables and much more information. Windscreen and window repairs and replacement for of cars, vans, commercial vehicles & contractors plant, machinery & agricultural glazing. Tinting service. A range of vehicles from large removal vans to small cars. Delivery and pick-up service. FREE pick up from ferry terminal, train or bus station in Oban. 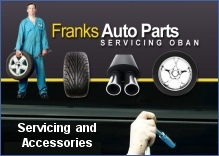 With over 25 years experience Franks have built up a reputation throughout the local area for competitively priced high quality car repairs, servicing and spares. Specialists in one owner, low mileage vehicles of all makes. Car hire and long-term parking ('park and cruise') also available. MacQueen Bros. operate six different sizes of removal vehicle from their purpose-biuilt 450-container warehouse in Oban. 24-hour rescue and recovery service 365 days of the year. Secure indoor storage for vehicles. MOTs, servicing, parts and car hire. This council-run airport welcomes private aircraft (PPR required) and also offers scheduled services to Colonsay, Coll and Tiree. Buy or hire quality bikes - major brands for sale plus a large fleet of high quality hire bikes for both adults and children. Commercial vehicle service and repair centre based in Connel. Truck and trailer repairs and servicing, diesel engine repairs and overhauls and more. Car servicing, M.O.T. preparation, electronic diagnostics, belts, brakes & clutches, welding & exhausts etc. Genuine parts used on request. Current timetables and route information for services between Glasgow and Oban and between Glasgow, Fort William and Mallaig. 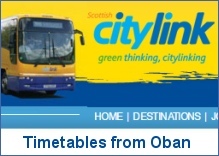 Check out bus services to and from Oban and the rest of Scotland on the Scottish Citylink site. Regular Glasgow-Oban service takes just under three hours. New and used motorcycles. New Honda motorcycles and ATVs, Yamaha outboards, Pioner boats. Outboard motor specialists, spares and repair. Car valeting, vehicle signwriting and vehicle 'wraps' (the application of large vinyl panels to a vehicle to totally change its appearance). Comprehensive guide to local bus services throughout Oban, Lorn and Argyll. Includes full timetables and fare details for most routes. Fully equipped family sized motorhomes for hire from Oban, allowing you to tour the West Highlands in a comfortable and luxurious vehicle.